We started our descent from the Altiplano at about 3800 meters where the air is thin and sometimes seems almost non-existent. I never did get acclimated to the high elevation even after almost 3 months. So riding down to the lower lands was very exciting to me, I had hopes I would get my health back and my motivation to ride. This section was going to be downhill. Yes down, down, down. I enjoyed the ride downhill for all 4 days. It had a very satisfying feeling. The road was paved, smooth and no traffic to speak of. The land was open range with llamas grazing everywhere. 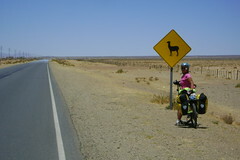 Instead of having the yellow road signs, "watch out for cows", there were a signs with black silhouetted llamas. I think llamas have about the mental capacity of cattle. Llamas must have suicide tendencies because herds of them keep running across the road just as cars where coming. I imagine they dared each other to run across just as the biggest, fastest bus was approaching and cheered each other when they made it alive to the other side and just went back to grazing when one did not make it. The first day, the winds were quiet and we got in about 100 kilometers. 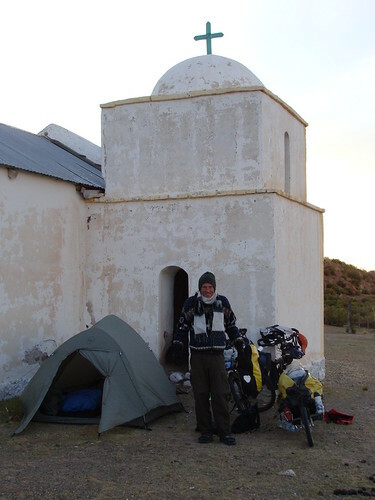 At the end of the day we found an little old adobe church and set up our tent on the quiet side out of the wind and out of sight from the traffic. We cooked dinner inside the bell tower, and watched the sun setting over high grassy plains. The landscape had an odd ruby purple glow which deepened the blood colored shadows. It felt good to be alone with Randy and let the night settle around us in our secret haven. The following day, a lady wandered down from a far away field to say good morning, wondered what we where doing. I don´t think she was impressed by our trip. Buy the look in her eyes, I think she thought we are a little crazy and why would anyone leave home to do something like this. She was more concerned in finding her dog. We did see the dog an hour before because it came barking at us and got bored and wandered. For some reason dogs like to bark at me and I like to throw rocks at them (but I didn't throw one at this one, honest). After ten minutes of conversation, she wandered off also. The morning ride proved to be calm, the sun was bright. The riding downhill was again fantastic. I regained some more enthusiasm for touring. 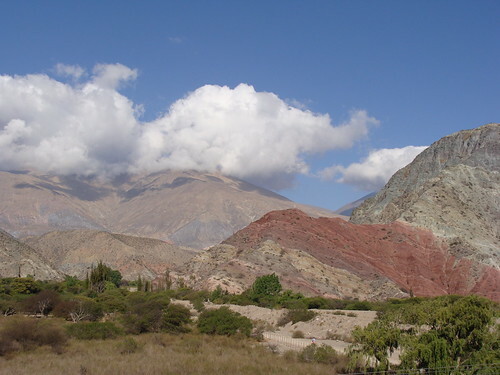 We stopped for a couple of hours at the small tourist town of Humahuaca. We toured the archeology museum and had a picnic lunch in the thriving plaza which was filled with artist stalls, dogs, tourist and playing kids. We intended to continue riding, but after a nice lunch and still wanting a shower, we got lazy and found a hotel. 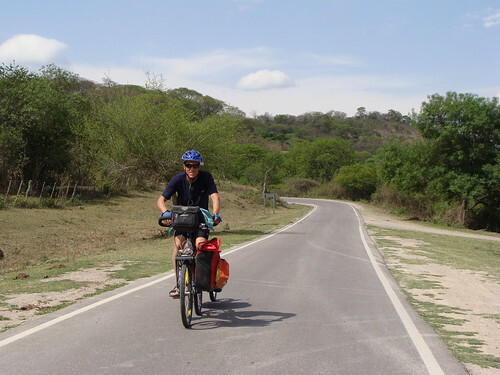 The next day we started off well, but after lunch, pedaling into the famous Argentina wind, we only made 10 miles before we decided to hide behind a tree for protection and read our books and wait until the wind died. Well it never did calm down so we camped there for the night. We had a visit from the police around 11:00 pm. but it was just a courtesy visit. When I greeted them in the dark "buenas noches", one replied as they approached with their flash lights blaring, De Donde son? (Where are you from?). I guess they figured we where harmless and let us be for the night. 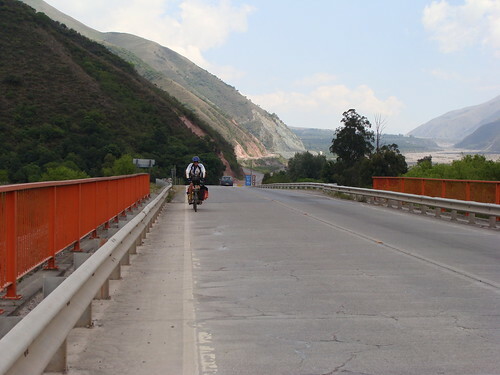 One the forth morning, again the wind was calm and we made it to Jujuy. 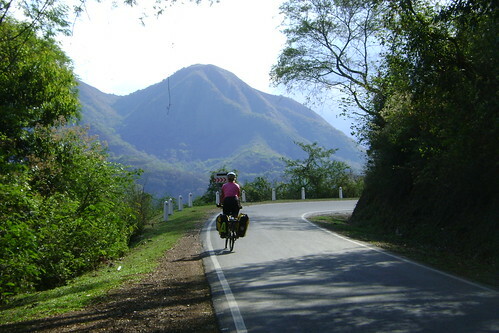 The ride was beautiful through a green valley with trees, red rock mountains on each side of the valley and green stuff called trees, which we have not seen for months. 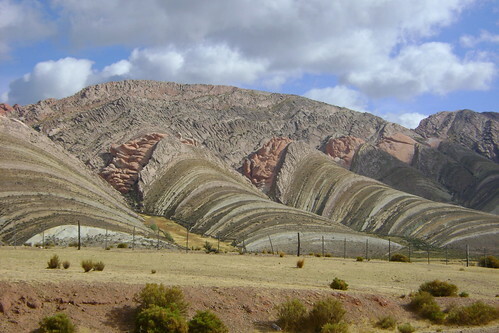 Jujuy is not as beautiful as I had imagined but we stayed there for a couple of nights as Randy came down with a cold and needed a couple of days in bed.